The Vista Detention Center, or VDF, serves as the primary inmate intake point for both males and females in North San Diego County. 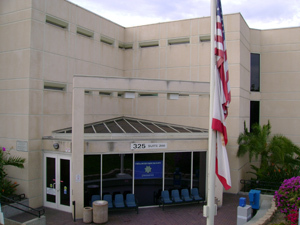 The VDF is one building in a large group of buildings known as the NCRC or North County Regional Complex. The other buildings include: the Vista Sheriff’s Station, North County Superior Court, and the North County Law Library. The majority of the inmates at the Vista Detention Facility are those awaiting court proceedings for cases in North County. The jail is administered by the San Diego County Sheriff’s Department and houses 884 beds. Visitation scheduling will depend on which portion of the jail an inmate is located and will require a reservation. All reservations can be made via telephone (from 10:00 am to 2:00pm) or email (24 hours a day except Mondays). If you plan to visit someone at the VDF, remember to check in at least one hour prior to your appointment. When someone is arrested, they are first taken to the police or sheriff station for booking and processing. The arrestee’s fingerprints will be recorded and photographs will be taken. Also, a nationwide background check will be conducted. Once completed bail will be set if the individual is eligible. Bail is set as per the County Bail Schedule and will vary greatly depending on the crime(s). Once bail has been set for an eligible inmate, he or she will only need to have a bond posted to be released. It all begins by calling us and speaking directly with a licensed bail bondsman who will be happy to walk you through the bail application process in detail. It is no longer necessary to meet face-to-face with a bail bondsman in order to get a bail bond. The entire process can be done via phone, fax or email. Our goal is to make the process as quick and easy for you as possible. If a friend or loved one is located at the Vista Detention Facility and you’d like to get them out, don’t waste another minute. Call us any time 24/7 and speak with a friendly, knowledgeable bail bondsman that can help you get them out of jail quick. We can be reached at 855-414-BAIL (2245).